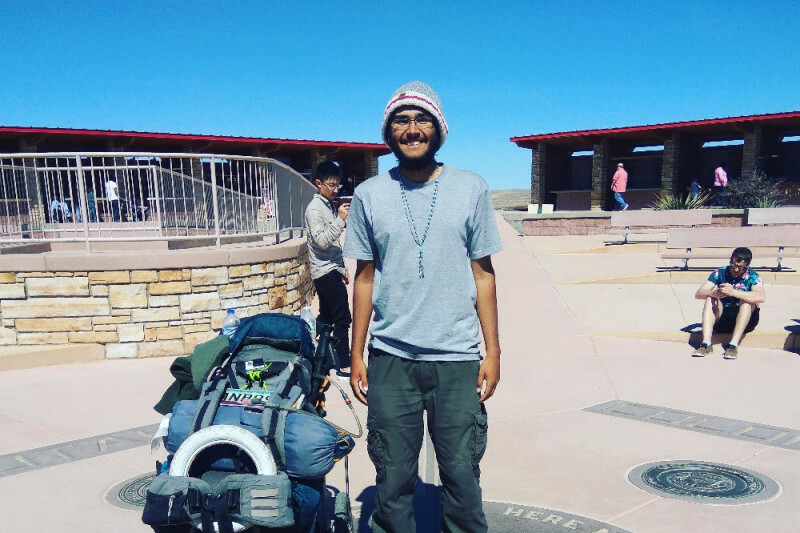 My name is Skyler, I'm an AmeriCanadian (dual citizenship) that's planning to walk across the United States! I'm raising funds for my trip which will take roughly 1 year. I'm going to use the money mainly for food and shoes along my journey. I live in Ontario which is where I'm starting from. I'm going to begin this trip by hiking a 100km (65mile) section of the Bruce trail, from Hamilton, ON to Niagara Falls. That will take me roughly a week and from there I will be crossing the border to Buffalo, NY. I'll be heading south to Atlanta, GA and to New Orleans, LA. From there I'll be heading west across Texas to Albuquerque, NM. I'll change directions again and begin heading northwest through Colorado, Utah, and Idaho, to Washington, then begin heading south again through Oregon and ending in San Francisco, California. It's a long way and I won't be walking all of it. I intend to hitchhike sections (especially in the Western/desert region). Any money donated is greatly appreciated! I intend to be taking lots of pictures and videos throughout the trip they'll be posted on www.reddit.com/r/SkylerTravels The route I'm taking is also on there. It's been a long time since I posted an update to Gofundme. So I'll just cover the last month from me leaving Capitan, NM and walking to Carrizozo, New Mexico and then going onwards, past the place where the first atomic bomb was dropped to a small city named Socorro. Now most people here probably will have never heard of it, but the astronomy lovers will have. It's the home of the National Radio Astronomy Observatory, and 50 miles to the west is the Very Large Array. That's the largest Radio astronomy place in the world. I actually got to stay with a world famous astronomer while I was there (he's actually Canadian as well; he went to U of T). He gave me a tour of the VLA and I even got to stand on one of the radio dishes. They don't usually let people do that aside from during maintenance or when they take Senators/Representatives up there to get more funding from Congress. So it was a rare honour. From there I went north through Belen and Los Lunas to Albuquerque, NM. For those Breaking Bad/Better Call Saul fans, I got to see several of the locations they filmed at, including having a meal at Los Pollos Hermanos. I spent nearly a week in Albuquerque since I ordered a laptop off of Amazon and it took a while. While I was in town I also got to see the Maxwell Anthropology museum at UNM. I left ABQ and went on part of old route 66. PArt of the road, if you went at exactly 40mph on the rumble strip, it would play America The Beautiful. Since I was walking it, I'd only catch a snippet of it here and there from cars driving by. I spent one night sleeping inside of a tavern in Madrid, NM which was fun. Then I went on to Santa Fe where I spent a day. I saw Meow Wolf which is this really cool, it's hard to describe but it's like if an art gallery was in the form of a haunted house. It's really awesome and if you're ever in Santa Fe, you must check it out. That's a legitimate command. Not long after I left Santa Fe, I lost phone service. I went to Los Alamos, which is where the first atomic bomb was created. During WW2 it was this really secret science place, many people who would later win Nobel prizes worked there. After the war it became an actual town and it's still a very science based community. I toured two museums while I was there. After that it was up to the Jemez mountains. Which were absolutely beautiful. I spent a few days hiking through there, reaching elevations up to 10,000ft above sea level. It made for some cold nights. On my last day in them I walked 8 miles uphill on an unpaved road. It was a little above freezing which meant it was warm enough for the snow to melt and turn the dirt road into a mudroad. The parts the weren't mud were ice and snow. I was walking about 1mph (I usually do about 3). Luckily I met a guy who let me stay at his house in Cuba, NM at the end of that day, so I got a nice shower and he made steak! From there I went up to Farmington. On my way there I spent a night next to an Apache Casino. From Farmington I went up to Shiprock, NM which is on the Navajo reservation. I got to go up and see Shiprock which is a really cool rock formation. After that it was on to Teec Nos Pos, Arizona. There I stayed with a master wool weaver named Roy. Jaime Oliver (that British food guy) actually stopped by for a tv show one time back when Roy was mayor of the town. While I was there I got to eat at a Navajo Honour Feast, where they honoured me and two others. That was really cool. The point of them is basically to honour someone for there accomplishments or the work they do in the community, no matter what it is. It's really just a good excuse to get people together and eat good food, which is exactly what happened. The Navajo have a special sheep, the Churro sheep, which only they raise and was on the point of extinction until recently. Both their meat and wool is pretty valuable. I got to eat some churro sheep, including part of the cheek of the sheep's head. They also made some blue corn bread. Blue corn is another one of their traditional foods. It's much sweeter than yellow corn. From there I went to 4 Corners, which is where Colorado, Utah, Arizona, and New Mexico all meet. It's the only pace in the world you can stand in 4 states at once. Unfortunately as I left, my stroller that I use to carry my stuff broke in half. I was kind of in the middle of nowhere, so I had to hitchhike to Cortez, Colorado (40 miles) to get to the nearest Walmart so I could buy a new one. For only the second time on my trip, I paid for a hotel room. From Cortez, I went north through some small towns to Dove Creek, CO and a little bit past, to the Utah-Colorado Stateline. When I was about a mile from there, a Sheriff Deputy stopped me. He ran all 4 of my license places as well as my ID. Personally I thought he was a bit rude doing that, given that I've had 15 encounters with police on my trip and none ran my license plates, just my ID. We talked for a little bit and he actually ended up buying me dinner at a restaurant on the State line (literally called Stateline Bar and Grill). That was last night. Since then I've crossed the border and am now in a pizza place in Monticello, Utah. So I've finished walking that section of the Bruce trail and have began my journey across America. I am currently about two days from Cleveland, Ohio. Thank you so much to all those who have donated to me. I live off of about $10 a day. My main costs are food, shoes, and a cellphone plan. So the money is being spent frugally and very much appreciated. I also have an Instagram in which I post pictures to (@skylerstravels), and I've been posting daily updates on my progress to my subreddit. What an amazing experience you must be having! You better make it to California for our vacation!